Over the half term holiday I’ve been staying in a lovely little town in Scotland called North Berwick. 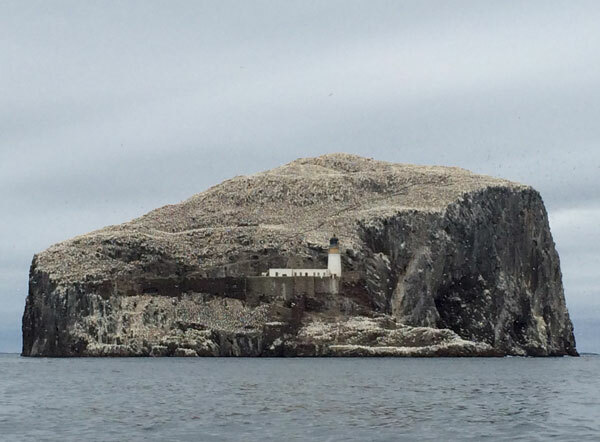 North Berwick is the nearest town to the world famous Bass Rock – the iconic volcanic structure jutting above the sea. 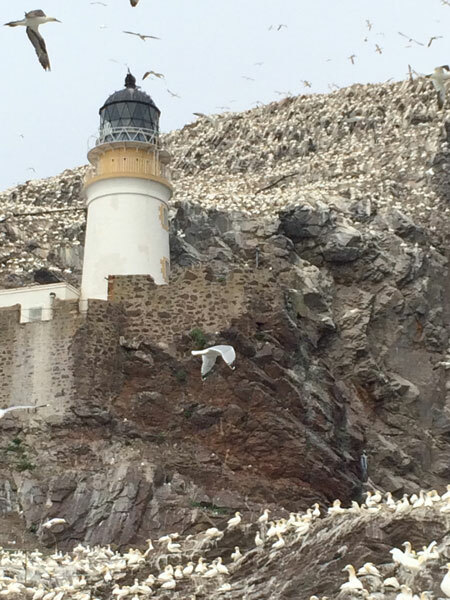 Just 20 years ago the island’s white top now stained with both gannets and their guano was only partially covered with birds. 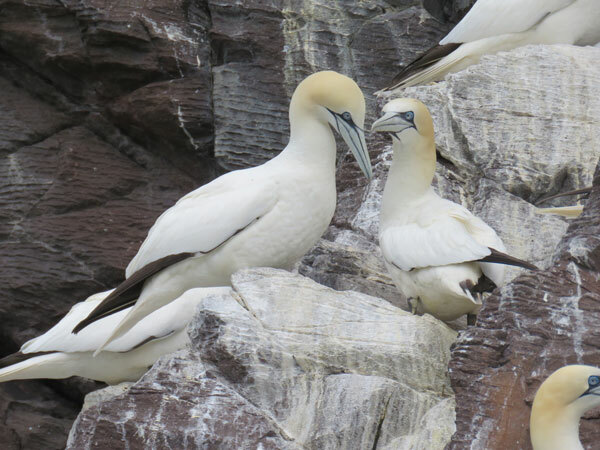 But recently more and more gannets have come back to the rock so that it has almost got to the stage where soon there will be no more room. 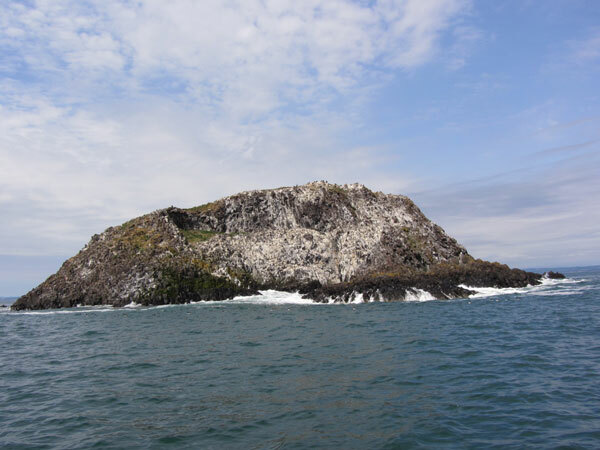 The boat trip allowed you to get very close to the gannets but the choppy sea made it difficult to take a picture. The one below is probably one of the best as you can see the creamy colours of the gannet’s plumage and the brilliant blue ring around it’s eye. 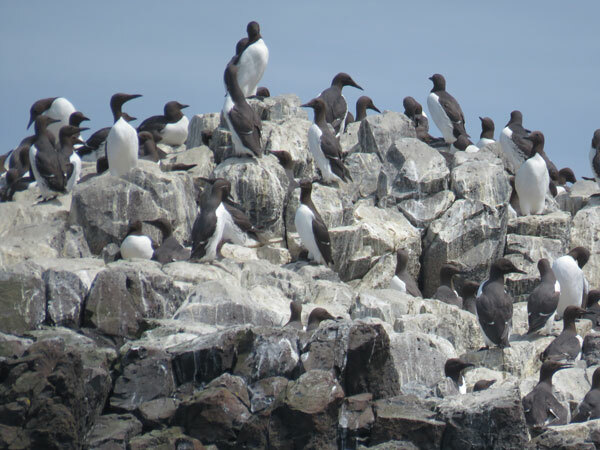 Not only did we go to Bass rock, but we also got to go to Craigleith, a nearby island with puffins, guillemots, razorbills, cormorants, shags and fulmars. There were many of these birds nesting on the island. Craigleith. Another picture demonstrating the difficulties of taking a picture on a RIB. 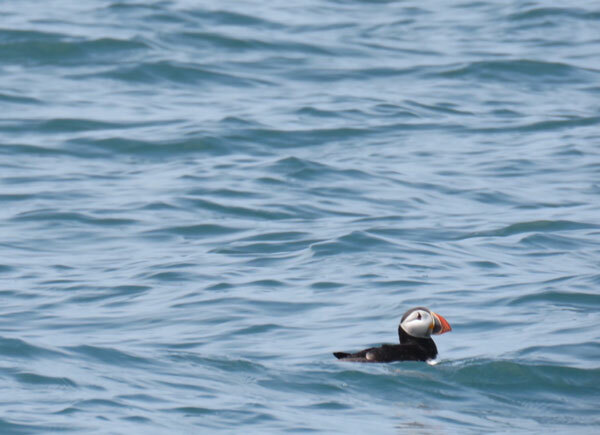 A very cute picture of a puffin sitting in the water. 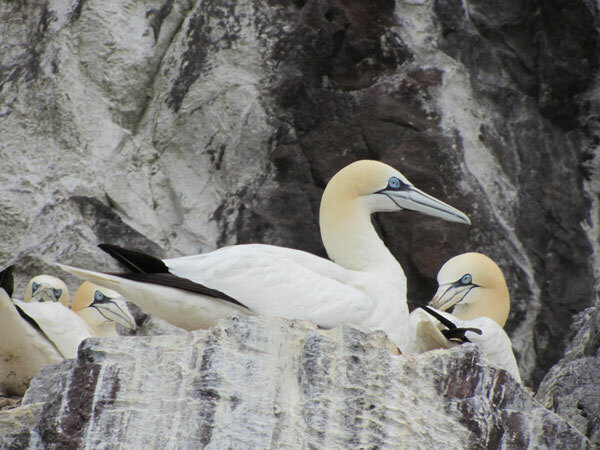 Gannets sitting on poo-stained rocks. The sheer number of gannets in the sky was mind blowing. Most of these were mainly juveniles socialising whilst all the adults were on the ground breeding. 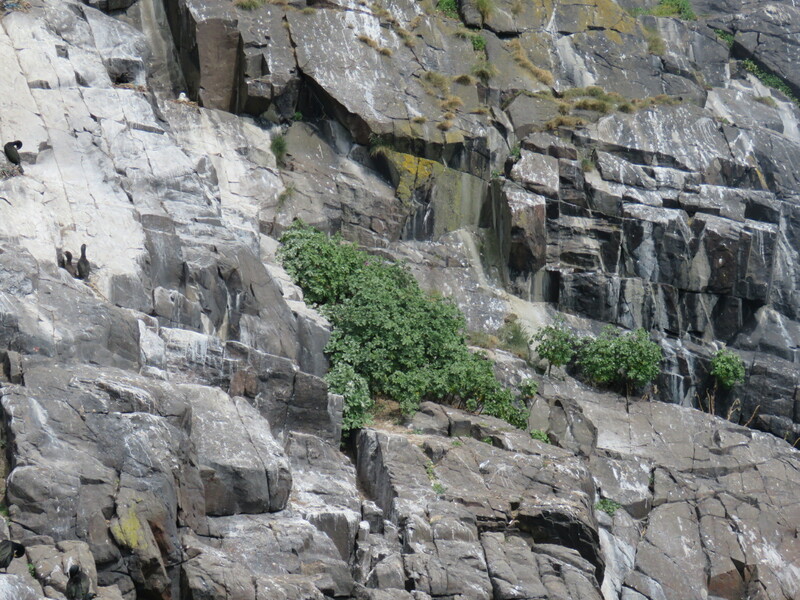 This plant below has been a real problem on islands such as Craigleith. It is called tree mallow and it is an invasive species that is a real threat particularly to puffins; as their roots block up the burrows the puffins use for nesting. In the picture below you can see a bit that was inaccessible so was left. You can see its size compared to the cormorants to the left of the picture and why it poses such a great threat. 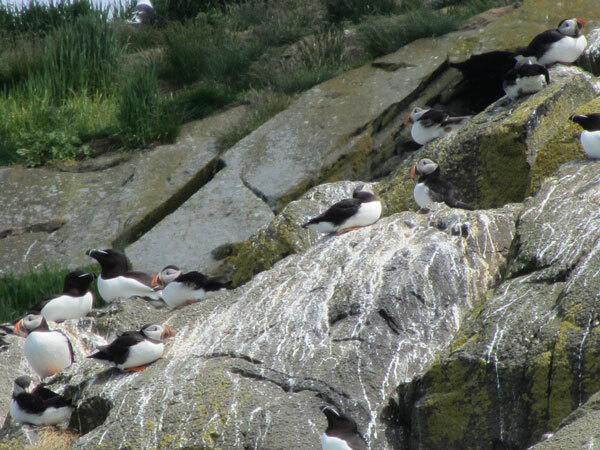 Luckily for the birds there are volunteer groups and projects like SOS Puffin run by the Scottish Seabird Centre that help try and get rid of the plant. Every year teams of volunteers cut back the invasive mallow so that there is room for the birds to nest. Select the Team Wildlife logo to find out more about the Local Patch Reporters blogging for BBC Wildlife Magazine. See the latest issue of BBC Wildlife Magazine. 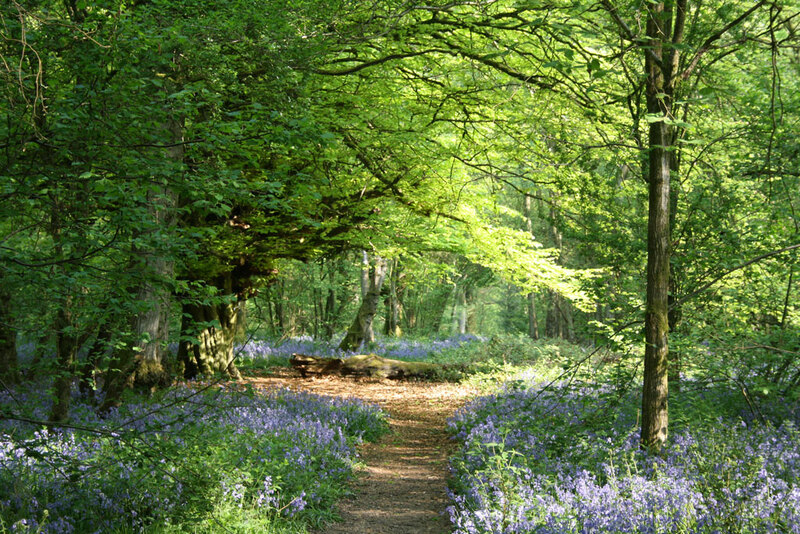 See what’s happening on the Discover Wildlife Local Patch Reporters Forum. Peter N on January caterpillar? ?